U.S. President Donald Trump delivers remarks at the state fairgrounds in Indianapolis, Indiana, Sept. 27, 2017. President Donald Trump plans to sharply reduce the number of refugees permitted in the United States. The move comes at a time when humanitarian groups say more people than ever should be admitted. The Trump administration said in a report to Congress Wednesday that the U.S. plans to admit no more than 45,000 refugees during the coming year. That would be the smallest number in more than 35 years. Former President Barack Obama had proposed that 110,000 refugees should be admitted during the next year. Trump is expected to announce the new plan soon. The limit of 45,000 refugee admissions would be in effect during the government’s new fiscal year, which begins on Sunday, October 1. It is lower than limits set in any year since the U.S. refugee program was established in 1980. Officials estimate about 54,000 refugees will have been admitted to the country during the 2017 fiscal year, which ends on Saturday. In the 2016 fiscal year -- the last full year of Obama’s presidency -- the U.S. welcomed almost 85,000 refugees. ​Immigration experts noted that the 45,000 limit is a “cap” – the highest number of refugees that can be admitted during the next 12 months. They said the number of refugees actually admitted by September 30, 2018, could be much lower. A person must meet several criteria to be considered a refugee in the United States. The government also has certain limits for different areas of the world. For example, 42 percent of all admitted refugees can come from Africa, and 39 percent can come from the Middle East and South Asia, according to the administration’s report to Congress. Those numbers generally have not changed since Obama’s time in office, experts say. 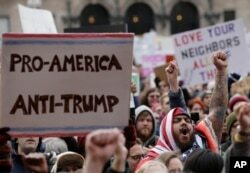 Izzy Berdan, of Boston, center right, wears an American flags as he raises his arm and chants slogans with other demonstrators during a rally against President Donald Trump's order that restricts travel to the US, Jan. 29, 2017, in Boston. Aid groups have sharply criticized Trump’s decision to reduce the number of refugees. They say that, because of worsening refugee crises in places like Syria, Myanmar and South Sudan, the United States must do more. Bill O’Keefe is with Catholic Relief Services. “With historically high numbers of innocent people fleeing violence worldwide, the United States response cannot be to welcome a historically low number of refugees into our country,” he said. Administration officials said the new refugee limit will improve national security and the country’s ability to properly examine and take in refugees. Worldwide, there were 22.5 million refugees last year, according to the UN High Commissioner for Refugees. That number does not include the many people who were displaced within their own countries because of war, violence, poverty or natural disasters.